With so much more to offer than its charming exterior, Briar Rose Winery provides its patrons with a variety of award winning wines. The storybook cottage of Snow White is a fitting home for Briar Rose Winery. It was built by a Disney artisan for his wife, and when Les and Dorian Linkogle purchased the land in the early 1990s, they promised not to change a single beam. And why would they? The enchanting architecture sets the stage for visitors who are about to taste the world-class wines inside. The Linkogles began growing grapes just a decade ago. At first they sold much of their crop to neighboring wineries, but when the resulting wines began winning medals, they decided to try their hand at winemaking, too. They began Briar Rose Winery in 2002. 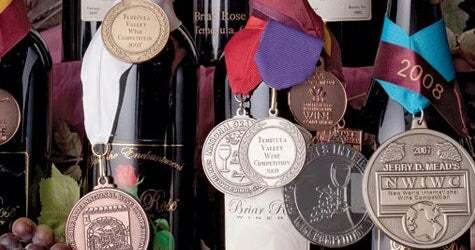 Since then, the awards and accolades have mounted, contributing to Briar Rose's fine reputation for producing distinctive, handcrafted Bordeaux-style wines in small lots. One such example is the winery's 2004 Petit Verdot. This showstopper garnered a Chairman's Award Gold Medal at the 2009 Riverside International Wine Competition and a Gold Medal at the 2009 Critics Challenge International Competition. Other critic pleasers include the 2005 Cabernet Franc, which won Gold in the Best of Appellation awards, and the 2003 Private Reserve Cabernet Sauvignon, which won Silver in the 2008 New York Finger Lakes International Wine Competition. This is the same Cab that was served at a dinner at the Library of Congress in 2008. Briar Rose is considered to be Temecula Valley's first cult winery, and to ensure that visitors get the attention they deserve, tasting is by appointment only. Each group of guests is assigned a personal server to guide them through a seated tasting. Premium tastings feature vertical samplings, allowing one to explore the nuances of single varietals. Those who notice motocross bikes hanging overhead are reminded of the Linkogles' original intention when they bought their 40 acres of land: they wanted to provide their son Larry, a champion motorcycle biker, with open space to ride. Now, with 23 acres planted with wine grapes and countless medals and accolades, it's safe to say that Briar Rose Winery is a breeding ground for all kinds of champions.